If only we could include the smell, of those vegetables barbecuing. You’ll just have to prepare this featured recipe to enjoy that smell. Grilling vegetables is really easy and a lot of fun. Barbecuing gets you outside to enjoy fresh air. Put on a little music and enjoy the view of your garden. If you bbq in the sun, you’re getting your daily dose of vitamin-D as well. The general rule to BBQ your vegetables is to cut them into pieces that will cook quickly and evenly. All the cut pieces should be of consistent thickness and no more than about 3/4 to 1 inch thick. Most will soak their cut vegetables in cold water for about 30 minutes before grilling them to keep them from drying out. BBQ vegetables are meant for entertaining, and grilling them brings out their natural sweetness, and the the seasoning mix or marinade adds a real punch of flavor your palate is sure to enjoy every time. 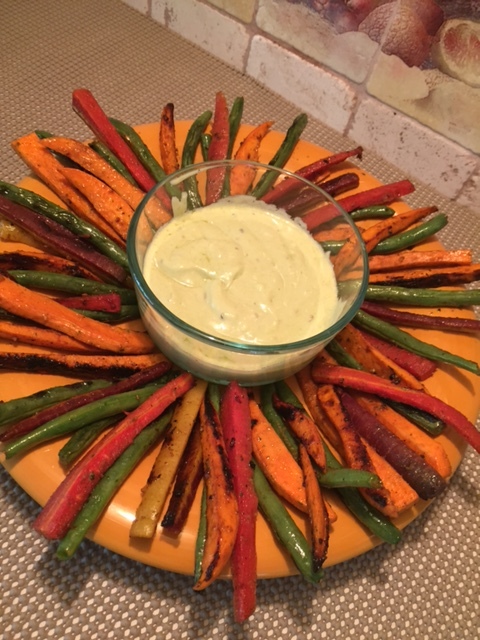 Let’s get started with our featured recipe: BBQ Garlic Lemon Vegetable Platter with a Avocado Greek Yogurt Dipping Sauce. This vegetable platter makes for a great appetizer to keep your guests happily waiting while you finish up the main course. Line your BBQ grill with some aluminum foil, put grill into place, and heat the grill with your favorite method (chips, charcoal, or gas). 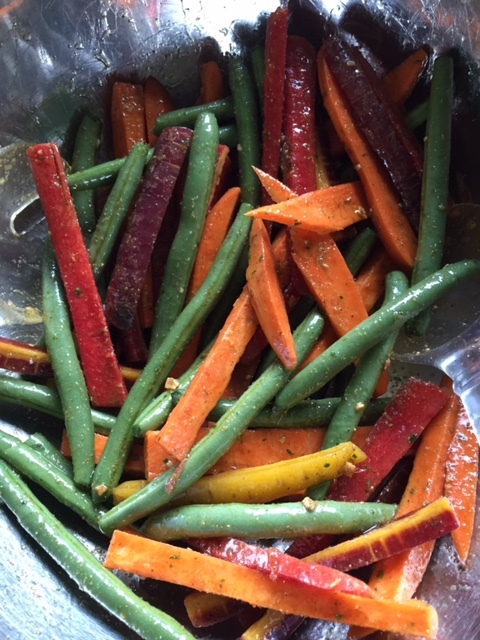 While waiting for grill to heat, in a large mixing bowl add the oil, vinegar, and seasoning. Next add the cut vegetables and mix until well coated. After preparing the vegetables (no we did not soak them in water, as the grill is foil lined they are not exposed to the flame) spread out the season coated vegetables onto the hot grill, then turn down fire (if using gas). Grill the vegetables, turning occasionally, for about 7 to 8 minutes (if using gas). Do not overcook, as the vegetables can dry out, and will become flimsy, which you do not want. You want your vegetables cooked, but still firm and with some crunch. 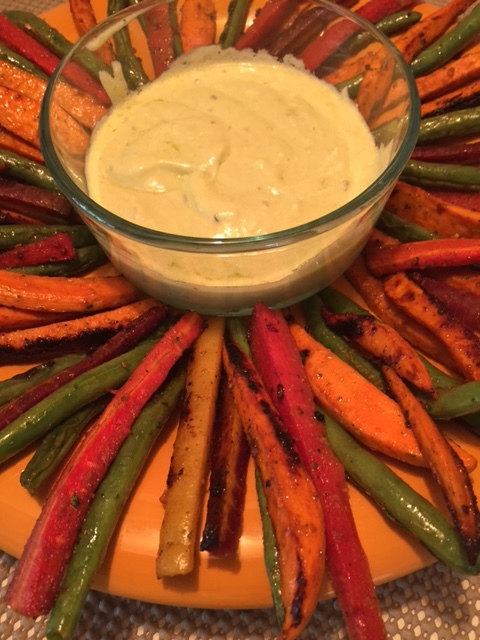 Remove BBQ vegetables to a plate, and set aside to cool some while preparing the dipping sauce. 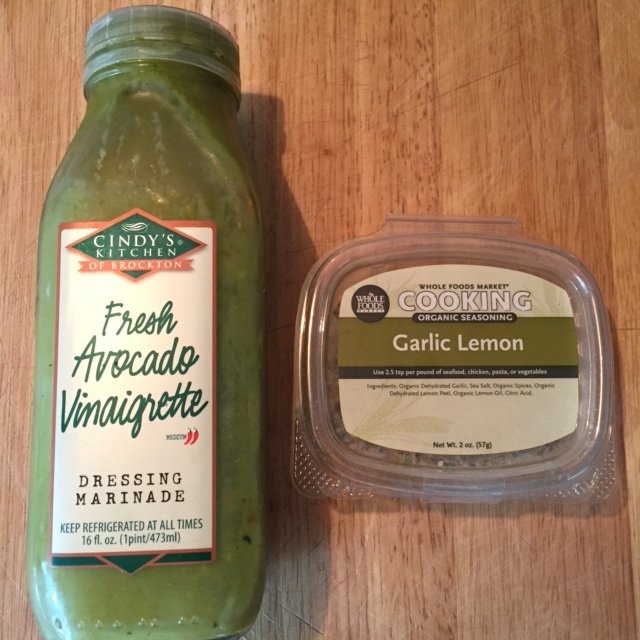 To a medium mixing bowl, add the avocado vinaigrette and greek yogurt, and mix until well blended. pour into a smaller bowl that will fit in the middle of a round platter with vegetables arranged around it. Serve this prepared platter as a side dish or an appetizer to entertain your guests as they arrive, or even put it on your Sunday Brunch menu. This entry was posted in BBQ, Brunch or Lunch, Dressings, Marinades, Salsas and Sauces, Gluten Free, Side Dish and tagged Asda, Barbecue, Barbecue chicken, BBQ Chicken, bbq vegetable platter, Brisket, Color photography, Count, Culinary art, French fries, Fresh Avocado dressing, garlic lemon seasoning, grilled carrots, grilled green beans, grilled sweet potatoes, marinade, The Carolinas. Bookmark the permalink. Looks like a great recipe especially for company. Thanks Jovina. I agree it is a great finger food to keep the guests busy while the host or hostess finishes up with last minute dinner details. and , Thank you Roger for visiting and leaving your thoughts. Have a great weekend approaching! !